- Arthur Souza, 52, was arrested this week for attempting to steal books from the Brooks Free Library in Harwich, MA. Souza is believed to have also stolen books from libraries in Hyannis, Brewster, Barnstable, and Yarmouth. Souza was discovered when a tipster spotted books with library markings being sold on eBay. - From Jennifer Howard, a thorough and well-written piece on library offsite storage. - A good reminder from Bookriot: "You Are Not Your Bookshelf." - Over at Interview, John D'Agata talks about his new book (with Jim Fingal), Lifespan of a Fact. - The Folger Shakespeare Library announced this week that it has acquired the theatrical archive of Lynn Redgrave. - Skinner, Inc.'s new Director of Fine Books and Manuscripts, Devon Gray, talks about her background and her plans for Skinner in a short "meet the expert" interview. - I had the great pleasure to speak at the Maryland Institute for Technology in the Humanities (MITH) this week, as part of their Digital Dialogues series. You can download a video or the Keynote version of my talk here, should you be so inclined. I discussed the Legacy Libraries project at LibraryThing, in particular the Libraries of Early America element of it. It was a real treat to see all the neat things the good folks at MITH are working on, as well! - Nicholas Carr writes about the DPLA in Technology Review, as "The Library of Utopia." - Jason Epstein's "How Books Will Survive Amazon" is well worth a read. - Last week's link to Mike Widener's post about including dealer descriptions in catalog records ended up prompting quite an interesting conversation on Twitter and elsewhere. Sarah Werner captured the discussion here, and Laura Massey weighed in over at The Cataloguer's Desk as well. I was pleased to see this take off, and I think it's led in some very interesting directions! - Big news (and good news) from Harvard this week, with the release of open metadata for 12 million works from across its libraries. More. - Over at Public Domain Review, Benjamin Breen discusses John White's sketches of the New World. - Ian Kahn posted a wrapup (with some videos) from this year's NYC book fair. Another good post about the fair to add to your reading list is "Love is a Doing Word," from Bibliodeviancy. - From Rick Gekoski, in The Guardian, "Book dealers court the press at their peril." - From the OUP blog this week, a quiz on Shakespeare in America. - Nancy Gibbs and Michael Duffy's The President's Club; review by David Greenberg in the WaPo. - Joy Kiser's America's Other Audubon; review by Liesl Bradner in the LATimes. - Robert Caro's The Passage of Power; review by Robert Draper in the WSJ. - Vortigern, An historical tragedy in five acts represented at the Theatre Royal, Drury Lane and Henry the Second, An Historical Drama Supposed to be Written by the Author of Vortigern. Together with An Authentic Account of the Shaksperian Manuscripts, &c. by William Henry Ireland (A.M. Kelley, 1971). Amazon (used). The only one of the Kelley Eighteenth Century Shakespeare reprints related to the Ireland forgeries I was missing. - The Rook by Daniel O'Malley (Little, Brown, 2012). Amazon. - The Watchers by Jon Steele (Blue Rider/Penguin, 2012). Publisher. - Your must-read for today, and I mean that, is Lorne Blair's post from this week, "Why the New York Book Fair Matters - To You, Me, and Everyone We Know." - Big news this week from Britain: the British Library has paid £9 million for the St. Cuthbert Gospel, called Europe's oldest intact book. - Brown University's Richard Noble talked to NPR this week about the recent (re)discovery of a rare Paul Revere engraving inside an old medical text. - Michael Sims has a piece in the NYTimes about the 60th anniversary of the publication of Charlotte's Web. Sims' book, The Story of Charlotte's Web, is a wonderful read. - Via Bryan Waterman, news that students at the University of Maine at Machias are preparing a new edition of Julia and the Illuminated Baron, one of the first American gothic novels. It'll be published as part of the Library of Early Maine Literature later this spring. - Mike Widener's posted on the Yale Law Library Rare Books Blog about his additions of dealer descriptions to book catalog records. - Matthew Heintzelman of the Hill Museum & Manuscript Library writes about the challenges of cataloging books without title pages. - The BBC covered the sale of the first part of the Birmingham Medical Institute's rare book library. - The latest bookseller profiled in FB&C's "Bright Young Things" series is Zoe Mindell of Philadelphia Rare Books & Manuscripts. - Clunes, Australia has been designated the first "book town" in the southern hemisphere. - Jordan Goffin's made a neat find in a George Washington book at the Providence Public Library. - At The Browser, Ann Blair recommends five books on the history of information. - Some previously unexhibited Poe letters and a manuscript poem will go on display at Richmond's Poe House Museum this week. - Christopher Benfey's Red Brick, Black Mountain, White Clay; review by Adam Goodheart in the NYTimes. - Katherine Frank's Crusoe; review by Claude Rawson in the WSJ. - John D'Agata and Jim Fingal's The Lifespan of a Fact; review by Justin Moyer in the Washington Post. - Paul French's Midnight in Peking; review by Fergus Bordewich in the WSJ. Book Review: "The Storytelling Animal"
Jonathan Gottschall's The Storytelling Animal: How Stories Make Us Human (Houghton Mifflin Harcourt, 2012) is a sprightly and captivating book on the origin and role of story in human history. Drawing on literature and media studies as well as scientific and psychological research, Gottschall offers a series of relevant anecdotes, case studies and ideas about the reasons and the ways in which story has evolved into a key part of the human experience. Encompassing everything from fairy tales to music to dreams to televised sporting events to videogames, Gottschall argues, experiencing stories benefits us in a whole host of ways, some of which we're still struggling to comprehend. One of these functions may be, Gottschall argues, "giving us practice with the big dilemmas of human life" (p. 83): he notes that "trouble" is a major theme in all forms of story, and so perhaps experiencing these stories better equips us to deal with trouble when we're faced with it in our own lives. I found Gottschall's chapters on dreams and on memoir particularly interesting, as well as the final chapter, in which Gottschall muses about the current state of story and its future - which may, he suggests, look rather different in many respects from what we're used to. He offers some final "suggestions" at the end which I found myself easily nodding along to as I read. I've just scratched the surface of this book; the author packs a whole lot into 200 pages! If you're one of those people, like me, who finds it easy to get "lost in a good book," or periodically realizes that tears are streaming down your face as you listen to a song, or wakes up after a particularly bizarre dream wondering where the heck that came from, give The Storytelling Animal a read. For the full April preview, go here. Also see my report on the Kenneth Nebenzahl sale. In this post, note particularly the final sale, yesterday's Jacques Levy auction at Sotheby's New York. - At the 11 April Heritage Auctions Historical Manuscript and Rare Books sales in New York, the Stone Declaration of Independence on parchment sold for $597,500, while the book from Washington's library fetched $101,575. A copy of Alexander Gardner's Gardner's Photographic Sketchbook of the War sold for $194,500, and a presentation copy of Thomas Jefferson's A Manual of Parliamentary Practice (1801) made $113,525. - The archive of letters from Joan London to her father Jack sold for $18,000 at PBA Galleries 12 April Fine and Rare Books sale. - At Swann's, Fine Books sale on 12 April, the top lot was a portion of a vellum leaf from a ~1000 CE Greek Bible, with text from Philippians 2. It had been estimated at $800-1,200, but sold for $33,600. Another leaf from the same Bible sold for $26,400. - Bonhams Mapping and Discovery of America sale on 14 April saw the 1512 manuscript containing accounts of early voyages to America do even better than expected; it made $326,500. A copy of Jeffreys' American Atlas (1776) fetched $86,500. - At Bonhams Titanic sale, the unused ticket to the ship's launch proved the top lot, at $56,250. A dinner menu from the ship for the night of 12 April 1912 sold for $31,250. - The Fine Books and Manuscripts Featuring the Michael Lerner Collection at Bonhams, held 16 April, saw a presentation copy of Ginsberg's Howl sell for $74,500, and a Jonathan Swift letter fetched $56,250. - Swann's 17 April Revolutionary Americana sale proved their best book/manuscript sale ever, making a total of $2,084,031 with 418 of 436 lots selling. A letter by Jonathan Trumbull as Washington's aide-de-camp to Gen. George Weedon reporting that Cornwallis had requested to open negotiations at Yorktown was the top seller, at $90,000. A Jefferson letter to Weedon sold for $57,600, and the David Hume letter about the stamp act made $48,000. - Bonhams Oxford sold Printed Books and Maps on 17 April. A presentation copy of James Hosburgh's Directions for Sailing to and From the East Indies ... (1809-11) was the top lot, at £3,125. - At Bloomsbury's Children's and Illustrated Books sale on 19 April, the top lot was an original Edmund Dulac watercolor, which fetched £11,000. - The Library of Jacques Levy sale at Sotheby's yesterday was a big one indeed. The sale brought in a total of $6,415,964, with many lots leaving their presale estimates far behind. The collection of David Roberts' drawings (est. $120,000-180,000) sold for $482,500, while a presentation copy of Oscar Wilde's The Importance of Being Earnest (1899) fetched $362,500 (over estimates of $80,000-120,000). An Eragny Press volume of Camille and Lucien Pissarro watercolors and wood-engravings sold for $314,500 (better than doubling its estimate), and Ferdinand Hayden's The Yellowstone National Park (1876) sold for $254,500. Another eight lots broke $100,000. - Studies in Bibliography Vols. 23, 41-44. Through the good offices of James Ascher (in exchange for a series of volumes to be named later). - Blue Asylum by Kathy Heptinstall (Houghton Mifflin Harcourt, 2012). Publisher. - Prague Fatale by Philip Kerr (Putnam, 2012). Publisher. Book Review: "The Civil War of 1812"
It was (and is) my intention to read more than a few War of 1812-related books during the bicentennial of the conflict, and I've started at last, with Alan Taylor's The Civil War of 1812: American Citizens, British Subjects, Irish Rebels, & Indian Allies (Knopf, 2010). Taylor's one of my favorite authors, and this book definitely doesn't disappoint. Let me just point out at the get-go that this book is not a comprehensive history of the War of 1812, nor does it pretend to be. Taylor focuses on the northern borderlands, specifically the region from Montreal in the east to Detroit in the west, where British Upper Canada bordered American territory along Lakes Ontario and Erie. The conflict in other regions is mentioned only in passing. Taylor lays out his thesis of the conflict as a civil war "between kindred peoples recently and incompletely divided by the revolution" (p. 6) by noting some of the many "overlapping dimensions" involved: the American and Loyalist conflict over Upper Canada, the partisan battle between Republicans and Federalists within the United States, the continued revolutionary aims of Irish Republicans, and the status of American Indian tribes who called the border region home. In his opening chapter, Taylor explores the origins of Upper Canada, formed in 1791 as a haven for American loyalists and as a base for the eventual reconquest of North America when the United States crumbled (which, of course, wasn't that far-fetched a possibility for a time). The imperial (and imperious) government of Upper Canada lured Americans across the border with cheap land and lower taxes; some 30,000 Americans moved north of the border in the two decades between 1792 and 1812. Much to the eventual chagrin of the Canadian officials, most of these "Late Loyalists" weren't drawn back to the bosom of the Empire for political or philosophical reasons, but for the aforementioned cheap land and lower taxes. After laying out some of the many grievances which led to the declaration of war in the summer of 1812, which included a potent mixture of maritime and frontier issues unresolved after the Revolution, Taylor turns to the remarkable level of partisan discord between Federalists and Republicans over the conflict; his description of it as a "very political war" (p. 157) is understated to say the least. Taylor's depiction of the extreme partisan bickering, in which Federalists discouraged recruitment efforts and openly attempted to block loans to fund the war effort, makes for fascinating reading, and his portrayal of the American army, filled with incompetant officers who disliked their troops and were (understandably) distrusted by those who served under them, makes it remarkable that they were able to accomplish anything at all. Much of the book is given over to a narrative of the several years of cross-border raids along the Great Lakes, in which one side or the other gained a brief advantage, only to lose it again not long after. The American goal of quickly conquering Upper Canada proved impossible after their string of defeats and their cross-border raids turned the region's residents against them and as the Madison government refused to publicly announce its intentions for Upper Canada should the United States have conquered the territory (whether it would be incorporated into the republic or if it would be returned to Britain as part of a negotiated peace). The section of the book I found most amazing was about the decision not to take control of the St. Lawrence River near Ogdensburg, which would have (if successful) choked off the British supply lines to the Great Lakes. Taylor records that this failure was the result of the influence of David Parish, an Ogdensburg land speculator who loaned money to the government to fund the war with the understanding that the St. Lawrence valley be kept out of the front lines so that his lands and businesses would remain undamaged. Just one of astounding decisions made by the Madison government during the course of the war. I was also very intrigued by and pleased with Taylor's chapters on the treatment of prisoners of war (on both sides), and by his concluding chapter on the ways the War of 1812 has been remembered and the consequences the conflict had on the British perceptions of both the United States and Canada. Even though the conflict ended in stalemate, it served to cement the status of America as a distinct political entity and ended the goal of adding Canada to the republic. While I often wished for a slightly wider lens, or at least a zoom-in at some other places, overall I very much enjoyed this book, and Taylor's hefty section of notes and sources (almost 150 pages) has already yielded a bunch more books to add to the reading list. - The 51st New York Antiquarian Book Fair concludes today. The first dispatches from the floor indicate a very successful show so far! - Profiles of LBJ biographer Robert Caro ran in both Esquire and the New York Times. Both are fascinating (and count me as one of those waiting very impatiently for May 1, when the next volume of Caro's work appears). - The FB&C "Bright Young Things" series continued this week with a profile of Andrew Gaub of Bruce McKittrick Rare Books. - Paul Collins writes in Slate about the history of threats to end Saturday mail delivery, and why that's probably just the beginning. - If you haven't been following Caleb Crain's posts about the planned NYPL renovations, get reading. - In other NYPL news, a $500,000 grant from The Polonsky Foundation will fund the digitization of documents from the Thomas Addis Emmet collection of American manuscripts. - UC Riverside will mark the acquisition of its 3 millionth volume this week; Terry Belanger will give the keynote talk at the 18 April celebration. - At Anchora this week, Adam G. Hooks notes some of the ongoing Shakespeare-related events at Yale this spring, and muses about the importance of one item in particular. - Suzanne Fischer reported this week on the ongoing effort at Brown University to decipher Roger Williams' shorthand in an unidentified theological volume. Follow along with the process at the JCB Books Speak blog. - Over at the AAS' blog, Past is Present, Caroline Sloat provides a history of the Society's seal. [For another "seal story," see my 2009 Beehive post about the MHS' device]. - From Salon, Alexander Zaitchik's "Amazon's $1 million secret" is entirely worth reading. - Harvard hosted a "strategic conversation" on the integration of libraries, archives, and museums (LAMs) - the Harvard Gazette has a writeup. - Florike Egmond's post on "re-discovering" Gessner's animal drawings made the rounds this week, but for those who might have missed it, I add it here too. - JK Rowling announced this week that her first non-Harry Potter book will be out this fall. It'll be titled The Casual Vacancy, which prompted a fantastic tweet from J.L. Bell. - Peter Carey's The Chemistry of Tears; review by Catherine Taylor in the Telegraph. - Stanley Corngold's new translation of Goethe's The Sufferings of Young Werther; review by J.M. Coetzee in the NYRB. - Lyndsay Faye's The Gods of Gotham; review by Ross King in the Washington Post. - Richard Fortey's Horseshoe Crabs and Velvet Worms; review by Dwight Garner in the NYTimes. - E.O. Wilson's The Social Conquest of Earth; review by Colin Woodard in the Washington Post. - I hesitate to even mention this book lest I accidentally get it any attention whatsoever, but David Barton's The Jefferson Lies is reviewed by Allen Pell Crawford in the Wall Street Journal. - Equal Rites by Terry Pratchett (HarperTorch, 2000). Green Hand. - The Letter of Marque by Patrick O'Brian (W.W. Norton, 1992). Green Hand. - The Thirteen Gun Salute by Patrick O'Brian (W.W. Norton, 1992). Green Hand. - The Divorce of Henry VIII: The Untold Story from Inside the Vatican by Catherine Fletcher (Palgrave Macmillan, 2012). Publisher. - The Truth of All Things by Kieran Shields (Crown, 2012). Publisher. - The House of Velvet and Glass by Katherine Howe (Voice, 2012). Publisher. It's not all that often that I find myself literally unable to go to sleep at night because I want to finish the book I'm reading, especially when I've got 150+ pages to go. But that happened to me last night with Alex Grecian's The Yard (Putnam, 2012) and after tossing and turning for a while, I finally just got up and finished the book, even though it was nearly 1 a.m. by the time I turned the last page. Grecian's story, similar to (even if not quite at the same level as) Caleb Carr's The Alienist and similar works, makes for a great read. Set soon after the Jack the Ripper killings, it centers around Scotland Yard's squad of murder detectives as they seek to discover who's murdering members of their own force. Interestingly, Grecian has livened things up a bit by providing chapters told from the perspectives of the murderers, so the reader follows both hunter and hunted. This is, at times, more than a little frustrating: you want to shout "He's right there!" at the detective who hasn't quite got the right clue yet. But it also creates a sense of urgency, which was, I think, what made me want to read it right straight through. There are a few twists and turns which lead nowhere, and there were a few minor things about the pacing and the plot that might have been done a bit differently - but overall, this was a thoroughly entertaining (and creepy) tale. I expect we'll be seeing more of the characters Grecian introduces here, and that's just fine with me! Book Review: "The Dark Defile"
The sale of books from Kenneth Nebenzahl's library at Christie's New York yesterday realized a total of $11,663,937, with four books surpassing $1 million and two coming close to $3 million! That, complete subscriber's copy of Edward S. Curtis' The North American Indian (1907-1930) was, as expected, the top lot, but it blew past the presale estimates and sold for $2,882,500. Battista Agnese's portolan atlas (~1542-6) fetched $2,770,500. Christoforo Buondelmonti's Liber insularum Archipelagi ended up at $1,762,500, and a 1592 Antonio Lafreri atlas was hammered down at $1,082,500. A copy of James Rosier's A True relation of the most prosperous voyage made this present yeere 1605, by Captaine George Weymouth, in the Discovery of the land of Virginia (1605) better than doubled its own estimate and sold for $554,500. Thomas Morton's New England Canaan found a buyer at $50,000 and New Englands Memoriall sold for $68,500. Sir Thomas Phillipps' personal seal sold for $18,750. - Anthony Grafton, writing in the Daily Princetonian, compares the renovations at Princeton's Firestone Library with with the planned changes at the NYPL Central Branch. - Exciting news from Boston this week: Skinner, Inc. announced the appointment of Devon Gray its Director of Fine Books and Manuscripts. - I like Eric Johnson's post on the Scholars' Lab blog this week, in which he offers a definition of what he's calling "open humanities," - "those aspects of the humanities aimed at democratizing production and consumption of humanities research." - The inaugural issue of the Journal of Digital Humanities is now ready for our reading enjoyment. I'm very much looking forward to digging in. - Via @DaelNorwood, a visualization of British, Dutch, and Spanish shipping for the period 1750-1800. - Thomas Penn's Winter King; review by Miranda Seymour in the NYTimes. - The Selected Letters of Charles Dickens (ed. Jenny Hartley); review by Nicholas Delbanco in the LATimes. - Elaine Pagels' Revelations; review by Dale B. Martin in the NYTimes. - E.O. Wilson's The Social Conquest of Earth; review by Matt Gazzaniga in the WSJ. - Lauren Groff's Arcadia; review by John Wilwol in the NYTimes. Book Review: "Midnight in Peking"
Paul French's Midnight in Peking: How the Murder of a Young Englishwoman Haunted the Last Days of Old China (Penguin, 2012) is the darkest sort of crime story: the sort that actually happened. French reconstructs the brutal murder of 20-year-old Pamela Werner, whose mutilated body was found beneath Peking's Fox Tower in January 1937. Using newspaper accounts, police records, autopsy reports, and a large investigative file on the case compiled by Pamela's father, French brings this gruesome tale to light. In "literary non-fiction" style, French recreates Pamela's last days, and provides background on her family, her neighborhood, and the foreign community in Peking during the last 1930s. He reconstructs the police investigation into her death, hampered as it was by "diplomatic" meddling, and, come to find out, severe police corruption and misconduct at several levels. It was left to Pamela's father to follow up leads and try to suss out what actually happened to his daughter, and his version of events has proven credible to French, who uses Werner's reports as the basis for his own narrative of Pamela's death. A bit hard to read in parts, as French spares none of the gory details - this is decidedly not a book for the squeamish. But it's extremely well written, and a rather amazing story that certainly deserved to be told. - Sotheby's held a Photographs sale on 3 April, which brought in $3,783,252. - Christie's Paris sold materials from the collections of the Hugo Family on 4 April, for a total of €3,229,537. A charcoal/ink drawing by Victor-Marie Hugo was the top lot, fetching €409,000. Various other fascinating lots were included in the sale; the catalog is well worth a browse. - Leslie Hindman held a Fine Books and Manuscripts sale on 4 April. Louis Dupre's Voyage a Athenes et a Constantinople (1825) was the top lot, at $41,480. - Also on 4 April, Bloomsbury sold Antiquarian Books: The Property of a Collector, Part I, in 575 lots. A presentation copy of Charles Babbage's Passages from the Life of a Philosopher (1864) sold for £6,500. - At Swann on 4 April, Property from the Estate of Filmmaker Gary Winick was sold, including 19th & 20th Century Photographs and Photobooks. You can find results here. - Christie's New York sold Photographs on 5 April, for a total of $6,880,450. - There's a key sale coming up on 10 April at Christie's New York as material from the Private Library of Kenneth Nebenzahl goes under the hammer. Just 165 lots, but all of them something to see (with six having presale estimates of at least $100,000). A complete subscriber's copy of Edward S. Curtis' The North American Indian (1907-1930) takes the top estimate, at $1,000,000-1,500,000. A lovely ~1450 illuminated manuscript on vellum of Christoforo Buondelmonti's Liber insularum Archipelagi could fetch $800,000-1,200,000; the same range is estimated for Battista Agnese's portolan atlas, dating from ~1542-6. Among the other lots are copies of Thomas Morton's New England Canaan and New Englands Memoriall, Sir Thomas Phillipps' personal seal, and more. - On 11 April, Heritage Auctions will hold Historical Manuscript and Rare Books sales in New York. Among the highlights: a copy of the Stone Declaration of Independence on parchment and a book from Washington's library. - At PBA Galleries on 12 April, Fine and Rare Books, in 300 lots. An archive of letters from Joan London to her father Jack is the top-estimated lot, at $10,000-15,000. - On 12 April at Swann, Fine Books, in 100 lots. Quite a few interesting incunabula, among other things. - Bonhams holds a Mapping and Discovery of America sale on 14 April, in 94 lots. A 1512 manuscript containing accounts of early voyages to America is estimated at $180,000-250,000. Also be to had: early examples of Mexican printing, and more. - The following day, Bonhams sells Titanic-related artifacts, including an unused ticket to the ship's launch, items removed from the ship, and props from the 1997 movie. - On 16 April at Bonhams, Fine Books and Manuscripts Featuring the Michael Lerner Collection, in ~400 lots. Much natural history and fine printing to be had. - At Swann on 17 April, Revolutionary Americana from the Allyn K. Ford Collection, plus a selection of Autographs. The Ford papers are a really remarkable collection, being sold off by the Minnesota Historical Society as being out of scope. See my piece in the spring Fine Books & Collections for more on this sale, which includes a body of correspondence to Gen. George Weedon (being sold off piecemeal) along with an important David Hume letter. - Bonhams Oxford holds a Printed Books and Maps sale on 17 April, in 507 lots. - Bloomsbury will sell Children's and Illustrated Books on 19 April, in 388 lots. - The Library of Jacques Levy will be sold at Sotheby's New York on 20 April, in 374 lots. Among the top-estimated lots are Ferdinand Hayden's The Yellowstone National Park (1876), estimated at $150,000-200,000; a collection of David Roberts' drawings ($120,000-180,000), &c.
- Doyle New York sells Rare Books, Autographs, and Maps on 23 April, including the Paige Rense Nolan autograph collection. A first octavo edition of Audubon's Birds of America is estimated at $50,000-60,000. - Christie's London sells Travel, Science and Natural History on 25 April, in 308 lots. As usual there's a good variety here, with some really fascinating things up for grabs. A 1794 W. & S. Jones orrery is one of my favorites this time around (est. £30,000-50,000); a ~1705/15 German pocket globe is also offered. - PBA Galleries 26 April sale of Fine Americana, Travel & Exploration, and Cartography. - Bloomsbury's 28 April Bibliophile Sale. Just one review copy this week, but it looks like a good one! - Afterlives of the Saints by Colin Dickey (Unbridled Books, 2012). Publisher. Mark Garvey's Stylized: A Slightly Obsessive History of Strunk & White's The Elements of Style (Touchstone, 2009) is, like the book it chronicles, a little volume full of delights. While I'm not sure the subtitle quite fits, since there isn't all that much about this book that I would call even slightly obsessive, on the whole I enjoyed the book for what it is: the story of The Elements of Style and how it came to be, alongside observations and reflections on the book from various writers. Garvey hasn't written a bibliographical history of The Elements of Style; while he offers some comparisons of the changes E.B. White made to Strunk's original text during the initial reworking and then on through the subsequent editions through the 4th, published in 1999, his main point certainly is not a thorough analysis of these revisions, nor of the book's publication history. * That said, he makes excellent use of the correspondence between White and the editors at Macmillan during the process of creating the first Strunk/White edition in 1958-59: some of those letters had me literally laughing out loud. And Garvey goes a step beyond, including here responses White sent to readers when they wrote in about the book asking about particular points of style or usage, pointing out mistakes, &c.
Short capsule biographies of Strunk, White and a few others who have played key roles in the life of The Elements of Style over the years make up a fair portion of the volume, as do Garvey's interviews with writers (from Dave Barry to Adam Gopnik) about some of the precepts and ideas laid out in the volume. Garvey also gives himself free rein to muse about the importance of the book over the years, and the ways in which it has been and is viewed by its readers. After reading this, I'm rather sorry to say that I don't think I've opened my copy of Strunk & White since college, when we used it in a "Freshman Precept" class. I recall enjoying it then, and finding it both amusing and useful ... but I think it may well be time to read it again. And everytime I read a little bit about White, it makes me want to gather all his books around me and just gorge myself on them, reading his essays and poems and letters and stories one right after the other. Probably better to read a little at a time, so I always have something else to look forward to. *If anyone writes such a book, please let me know; I'd love to read it. - At the Swann Eric C. Caren collection sale, held 15 March, the top lot ended up being a copy of the 1622 A briefe Relation of the Discovery and Plantation of New England, which sold for $55,200. The original manuscript indictment of a Salem "witch," Margaret Scott, sold for $31,200, as did a copy of the 13 June 1789 Gazette of the United States, which contains the first printing in any form of the Bill of Rights. The bookplate Paul Revere engraved for Isaiah Thomas fetched $1,320. - PBA Galleries old Fine Literature & Fine Books in All Fields on 15 March. The copy of H.G. Wells' first book, The First Men in the Moon, sold for $7,800. The set of twelve photographs of Charles Bukowski did not sell. - The top seller at Bloomsbury's Travel, Natural History, Sport & Science sale on 21 March was George Edwards' A Natural History of Birds, which made £4,000. The South Polar Times (1907-1914) failed to sell. - Christie's 21 March sale of Fine Printed Books realized £284,712, with a de Rossi atlas taking the top spot at £18,750. The unique, extra-illustrated copy of Man Ray's Les main libres (1937) was unsold. - At Bonhams Books, Maps & Manuscripts sale on 27 March, the top seller proved to be a presentation copy of T.E. Lawrence's The Seven Pillars of Wisdom, which sold for £50,450. The copy of Fermat's Varia opera mathematica sold for £49,250. Only one of the four large manuscript maps of Massachusetts roads sold, for £34,850, but a couple other MA manuscript maps did well. Churchill's presentation copy to Neville Chamberlain of Marlborough: His Life and Times (1933-1938) fetched £45,650. Arthur W. Dorling's bookplate collection fetched £10,625. - Sotheby's Paris 28 March Livres illustrés Modernes de la Bibliothèque R. & B.L. sale saw some terrific surprises. The 1913 work La prose du Transsibérien et de la petite Jehanne de France, estimated at EUR 40,000-60,000, sold for a whopping EUR 312,750, while a copy of the Joan Miro/Paul Eluard work A Toute Épreuve (Geneva, 1958) which rated the same estimate, sold for EUR 228,750. A rather impressive number of other lots also did extremely well; the sale realized at total of EUR 4,493,525. - PBA Galleries sold Americana, Travel & Exploration, and Cartography on 29 March. The top seller was a copy of the first Buddhist world map printed in Japan, Zuda Rokashi's 1710 Nansenbushu Bankoku Shoka No Zu, which sold for $5,700. - Bonhams held a Polar Sale: Scott and Amundsen Centenary, on 30 March. A farewell letter from Scott to Sir Edgar Speyer proved the top lot, at £163,250. Book Review: "Mimes in Vichy France"
Jacques Legrand's Mimes in Vichy France (Louisiana University Press, 2012) is a captivating and provocative exploration of a woefully under-studied aspect of French theatrical and street performance during World War II. 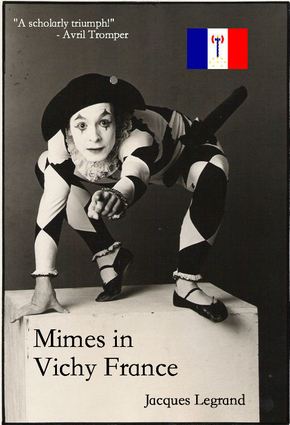 While the role of mimes in the postwar period has been well chronicled (in Jean Gaspard's The Mimes of France and other works by Dan O'Leary and Margo Schmidt), and of course the origins of mime are well-documented (see Allardyce Nicoll's 1931 masterwork Masks, Mimes, and Miracles: Studies in the Popular Theatre and the introductory chapters to Lilian Sayce's Let's Mime), the mimes of France during the period of Nazi occupation have been much neglected. Jacques Legrand's book does much to correct this unfortunate lacuna. Mimes in Vichy France was originally published in French back in 2007 by Presses Universitaires de France, and given Legrand's untimely death the following year, there was much concern that the book might not be released in English. So I was delighted to learn early this year that Adam Garvey's English translation had not only been completed, but had found an American publisher in Louisiana University Press. While the translation in places leaves something to be desired (Legrand's prose is not nearly so stilted as Garvey would have it), on the whole Garvey has done the scholarly community a great service, and deserves our thanks. Legrand spent decades researching this book, combing through archival collections around France and Germany and (most importantly) interviewing several surviving mimes and members of their families about their activities during the Vichy period. His painstaking comparisons of personal recollections with archival documents show in many cases how the two offer strikingly different versions of history. Several former mimes insisted to Legrand that they had been jailed by Vichy authorities for performances deemed disrespectful to the regime, but court documents revealed that they were at most fined by the courts. In one case, mime Pierre Moreau insisted that he saw Vichy authorities summarily execute a fellow mime, Matthieu Fabrice, who went by the nom de theatre Bom-Bom. Legrand, however, managed to locate Fabrice's family (now living outside Lyon), who provided documents showing that Bom-Bom had not only survived the war, but continued performing until his death in 1967. As a study of historical memory alone, this book would be worth reading. Carefully reconstructing what amounted to a civil war among French mimes during the Vichy period, Legrand is able to document as no one has ever done before the ways in which mimes both resisted and collaborated with the Vichy government, and how anti-Vichy mimes coordinated with Free French partisans to undercut the regime's authority. The key role played by mime saboteurs in Nimes and Lyon is presented here for the first time, and makes for fascinating reading. Thoroughly enjoyable, and sure to provoke significant new scholarly debates over the important contributions of mimes to the political and military history of Europe. I spent the last two days at the American Antiquarian Society's "Needs and Opportunities" conference, so watch for some thoughts on that this week, as well as some highlighting of a few of the really neat projects and websites I learned about. - New site to watch: History of the Book at Harvard. - Well this is something: the University of Cincinnati's College of Design, Architecture, Art and Planning is hosting a show, "Faux Real," featuring more than 90 forgeries of Mark Landis (some given to museums, others sent to the museum specifically for the show). Appropriate that the exhibit opens today! - From the Harvard Gazette, "Blue, gray, and crimson," on Harvard and the Civil War. - Launching this week, Forgotten Chapters of Boston's Literary History, a joint project of Boston College, Massachusetts Historical Society, and the Boston Public Library. - Writing in The Millions, Cory MacLauchlin has an essay about "finding" the lost manuscript of A Confederacy of Dunces. - Robert Darnton talks about the DPLA with JISC. - The Audubon "Bird of the Week" at Trinity College is my particular favorite, the Carolina Parrakeet. - Caleb Crain is doing some great work on the NYPL's plans for drastically changing the library's Central Branch. See his original post, and a followup. - Rick Gekoski suggests we're now in a "new chapter for rare book collecting." - From the Johns Hopkins magazine, a surprising story about the unexpected return of a stolen illuminated manuscript. - Via The Feature, not a new article but an interesting one: "The Encyclopedists," from the February 1868 Atlantic Monthly. - I haven't had a chance yet to read Craig Mod's "The Digital-Physical" yet, but it's on my reading list for this week. - Nigel Beale's begun a series on Library and Archives Canada, calling the current state of affairs a "national disgrace." More from Rebecca Rego Barry at Fine Books Blog. - Peter Carey's The Chemistry of Tears; review by Edmund Gordon in the Guardian. - Lawrence Powell's The Accidental City; review by Jonathan Yardley in the WaPo.